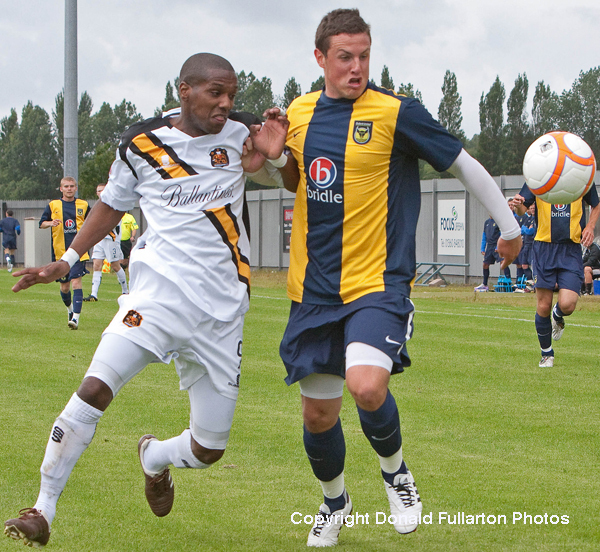 DUMBARTON welcomed English League 2 side Oxford United for an entertaining friendly match at the Strathclyde Homes Stadium, but were well beaten. Sons trialist no.9 battles for possession. The gulf between full-time football and part-time was clearly shown as the visitors outmuscled the home side and dominated for most of the match. Alfie Potter opened the scoring for United in 19 minutes when keeper Stephen Grindlay could only parry an Asa Hall effort and Potter followed up to net. The 500 crowd had to wait until the 67th minute for the second goal, when the diminutive Sam Deering broke through, was forced wide on the right, but then sent in a perfect chip over Grindlay's head and into the net. Jim Chapman's men, including another trialist no.9, worked really hard and defended manfully, but were always closed down and the threat nullified if they got near the Oxford goal. As a result keeper Eastwood had barely a save to make.